Tag line: "The One...The Only KING OF MONSTERS as the new demon of the atomic age!" 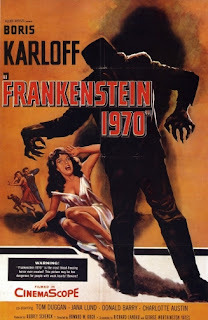 Frankenstein 1970 marked the first time in 14 years that Boris Karloff appeared in a movie with “Frankenstein” in the title (the last being 1944’s House of Frankenstein, in which he played Doctor Niemann). In fact, it was the last Frankenstein he’d ever make, and as I sat watching this movie, I couldn’t help but wish he had turned the part down. In need of some quick cash, Baron Victor von Frankenstein (Karloff), a descendant of the man whose “experiments” led to disaster 230 years earlier, agrees to allow a film crew to shoot a movie in and around his family’s ancestral home. Directed by Douglas Row (Don ‘Red’ Barry) and starring the lovely Carolyn Hayes (Jana Lund), the film is (naturally) a horror flick, but the true terror lies hidden underground in the Baron’s secret laboratory. With the money he’s getting from the production crew, Baron Frankenstein intends to buy an atomic reactor, which he believes will help him succeed where his ancestor failed. Yes, Baron Victor Frankenstein is trying to reanimate a dead body he assembled from scratch. And should he find himself in need of an extra body part, he can always harvest it from the movie’s cast and crew, who are staying just upstairs! Frankenstein 1970 is a bad film, but a few rays of sunshine do peak through from time to time. The opening sequence, for example, where a frightened woman runs through a forest to escape a tall, lumbering monster, is exceptionally intense (alas, it’s also a cheat: the “chase” is actually a scene from the movie being shot on Frankenstein’s land; soon after the creature corners the girl in a swamp, we hear the director yell “cut!”). The set pieces are also impressive (though released by Allied Artists, Frankenstein 1970 was shot on the Warner Bros. backlot), and a monologue delivered by Karloff, where he recounts the checkered history of the Frankenstein family, proved beyond a shadow of a doubt that the horror icon still had a spark or two left in him. Unfortunately, this speech is also Karloff’s best scene. Through the rest of the film, he hams it up in a big way, and as a result, his performance is often a distraction. Of course, Karloff isn’t the only weak link in this chain. There are sequences that drag on way too long (the first time we follow Frankenstein into his basement lair feels like it goes on forever), and the few extraneous subplots there are add nothing to the movie; a love triangle between director Row, his leading lady Carolyn, and Row’s current wife, script supervisor Judy Stevens (Charlotte Austin), falls flat. But, in the end, it’s Karloff’s flamboyant portrayal that sinks the film, and the mere fact that this great actor, who brought such depth to the role of the monster in several 1930’s classics, finished out his “Frankenstein” run with this mediocre ‘50s horror flick is enough to bring a tear to your eye.